MAGNETIC BASE CLIP–DESIGNED FOR PRECAST CONSTRUCTION! Victory Bear’s Rustication and Base Clip system is now a perfect choice for your metal precast beds, thanks to our new Magnetic Base Clip. 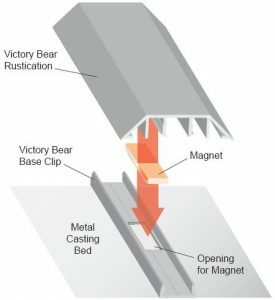 This system combines the superior Victory Bear finish with powerful magnets to securely fasten the forms to your bed. Our specially-designed magnets are reusable, and install quickly and easily with the special Base Clip. Victory Bear Rustications and Chamfers use a patented Flex Edge Seal, virtually eliminating the need to caulk while creating sharp, crisp lines. Without caulk, cleanup is easier than ever! Can be used with any size Victory Bear Rustication that uses the Base Clip system. Simply place the special Base Clip on the casting surface and secure with the magnets. Victory Bear’s patented Flexible Edge Seal forms a tight seal against the casting surface, preventing concrete seepage while creating sharp, crisp lines. PVC rustication’s clean release creates a smooth finish.